What Your Baby Should Wear for a Lifestyle Newborn Session | Northern VA Newborn Photographer — Northern VA Newborn, Maternity, and Family Photographer serving Ashburn, Leesburg, Purcellville, & Loudoun Co.
One of the most frequently asked questions I get as a photographer here in Northern VA is, "What should my baby wear for our lifestyle newborn session?" I send all my clients a welcome guide with information on how to prepare and what to wear, but I thought it might be helpful to expand a little bit on that! Read on for helpful hints on how to dress your baby for your lifestyle newborn session! There is no better way to show off your baby's brand-newness and teeny tiny features than to have them nakey when I arrive. I put the "almost!" in there because I very rarely ever photograph newborns completely naked, preferring to keep a diaper on instead. (One of the perks of lifestyle newborn photography!) To keep baby happy, be sure to turn your heat up (or cut the AC if it is a hot day) so that he or she can stay warm despite being undressed! Personally, I *love* flaky baby skin but if it bothers you, feel free to put a little baby lotion on before I arrive. (Aveeno has always been a favorite of mine with my own kiddos!) You will want to avoid using Vaseline, Aquaphor, or coconut/olive oil on your baby right before your lifestyle newborn session. They are great moisturizers and I have used all of those on my own kids, but they will result in your baby looking very shiny in their images. Another little tip is pick up some diapers by Honest Company (if you aren't cloth diapering, that is!). They come in the cutest patterns and photograph really well! They have a free trial that you can sign up for to get some for FREE!! I love taking "almost-birthday suit" shots at the beginning of the session when babies are generally the happiest and most content. At some point in every newborn session, babies will need a diaper change and to take a feeding break. I love getting in on the action and photographing that tiny little diaper getting swapped out. Before getting topped off with some more milk, I often ask parents to put their baby in a onesie to try a different look for the session. Plain white onesies are classic and really emphasize how teeny, tiny your newborn is! I find that other outfits can swallow newborns up in those early few weeks so onesies really work well to help show their true size. You will want to be sure to have a 'newborn' sized onesie and maybe even a preemie, depending on the size of your baby. The Gerber brand generally runs on the smaller side, so I love those for newborn sessions! If you don't have any, don't worry...I bring some to every session. I usually advise clients to stay away from clothing other than onesies in general for their babies and to stay VERY clear of any clothing that has characters or writing on it. Although they have tons of personality, they can be ill-fitting or distracting in images and pull your eye away from the true focus...your sweet baby's little face! BUT! I am going to go ahead and be a little contradictory rule-breaker here and say that I might start making exceptions for certain trends that are hot right now. For example, I really love the modern look of this trendy outfit and these matching shirts are super cute because they emphasize the relationship between father and child and tell a fun story. Do you have any other favorites you'd add to the list? I'd love to hear about them in the comments below! The babies are the star of their lifestyle newborn session and I love to keep things very simple so that we don't take away from that. You really don't need accessories at all because babies are perfect just the way they are, but I know as a girl mom that the urge to doll that baby up is FOR REALLLLLL. Simplicity is the key when it comes to accessories though. You will want to avoid large-sized bows or flowers on headbands and stick with simple, sweet tiebacks instead. I prefer tiebacks to headbands because newborns are sooooo tiny that it often takes a few weeks for them to grow into headbands and they won't stay in place. Doing a quick search on Etsy for 'newborn girl tiebacks' brings up a great list of choices. Just remember, the simpler, the better! For boys, knit baby booties are always a sweet accessory. Bonus points if they are hand-knit by a loved one!! 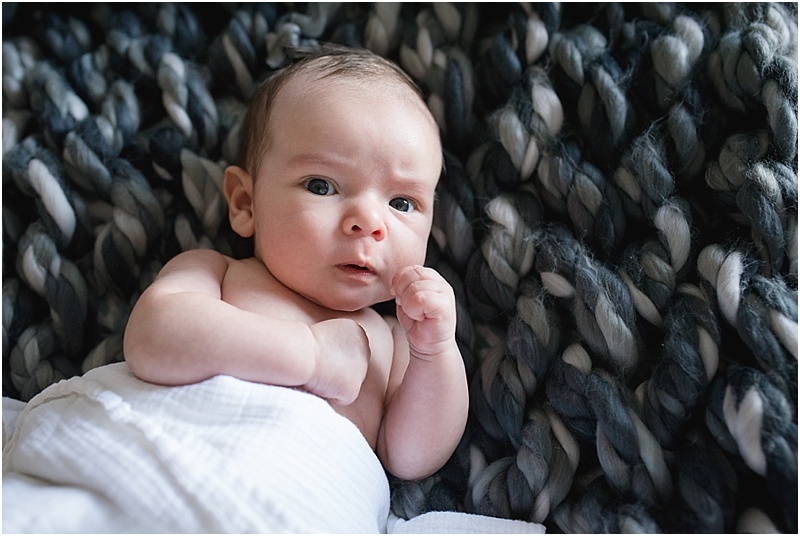 Interested in a lifestyle newborn photography session? Contact me today for more information!